Some experts expected more "against" votes for the energy industry this year, but that did not come to fruition. Using data as of June 11th, 2015, ISS vote recommendations by Russell 3000 energy segments are shown in the table below. 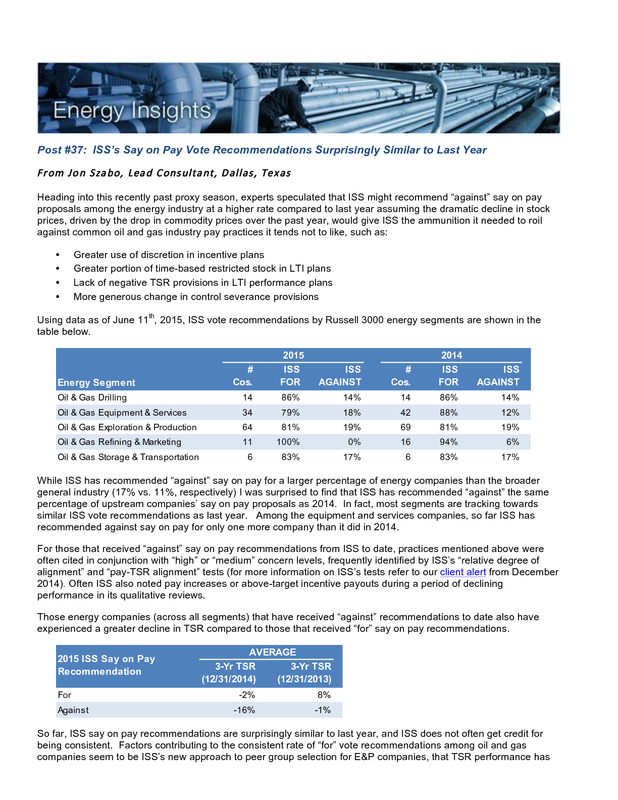 While ISS has recommended “against” say on pay for a larger percentage of energy companies than the broader general industry (17% vs. 11%, respectively) I was surprised to find that ISS has recommended “against” the same percentage of upstream companies’ say on pay proposals as 2014. In fact, most segments are tracking towards similar ISS vote recommendations as last year. Among the equipment and services companies, so far ISS has recommended against say on pay for only one more company than it did in 2014. For those that received “against” say on pay recommendations from ISS to date, practices mentioned above were often cited in conjunction with “high” or “medium” concern levels, frequently identified by ISS’s “relative degree of alignment” and “pay-TSR alignment” tests (for more information on ISS’s tests refer to our client alert from December 2014). Often ISS also noted pay increases or above-target incentive payouts during a period of declining performance in its qualitative reviews. Those energy companies (across all segments) that have received “against” recommendations to date also have experienced a greater decline in TSR compared to those that received “for” say on pay recommendations. So far, ISS say on pay recommendations are surprisingly similar to last year, and ISS does not often get credit for being consistent. Factors contributing to the consistent rate of “for” vote recommendations among oil and gas companies seem to be ISS’s new approach to peer group selection for E&P companies, that TSR performance has generally been poor across the board in certain industry segments (the “low tide” effect), and that companies have begun to adopt pay practices that ISS prefers, such as greater amounts of performance-based LTI or negative TSR governors in relative TSR plans. 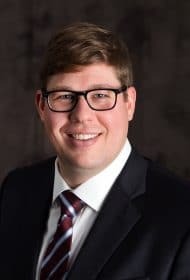 More specifics on these factors will come to light as we examine pay practices over the coming months as part of annual peer group market reviews.